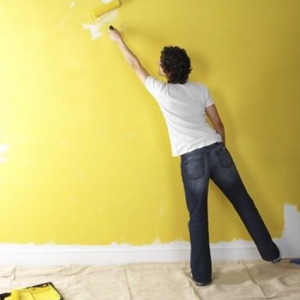 First and foremost you need to start with a clean surface for paint to adhere to previously painted walls and woodwork. Just use a sponge and a trisodium phosphate cleaner to easily wash off dirt, and grime. Be sure to buy TSP concentrate and mix it with water, as it’s a better value than liquid TSP. Just use TSP on all of your woodwork. It slightly etches the wood, which helps the paint form a better bond. Use it in kitchens to clean grease from walls, in bathrooms to remove hairspray and around light switches to remove fingerprints. Wear rubber gloves and turn up the cuffs to keep the TSP solution from running down your arm. Buy a paint strainer or just use an old pantyhose to strain the paint. Place the strainer over an empty 5-gallon bucket, then pour the paint through the strainer. The strainer catches any debris in the paint. This is also a great time saver to start boxing your paint. It’s tempting to cut in along all the trim, the ceiling and the corners in the room at once, however you’ll get better results if you cut in just one wall, then immediately roll out the wall before cutting in the next one. That’s because if you roll out the wall right away, while the cut-in paint is still wet, the cut-in paint and the wall paint will blend much better, reducing the chance of lap marks. Taping off all your trim with masking tape is time consuming and doesn’t guarantee good results. Paint can still bleed under the tape. In short, taping off everything is a waste of time. Instead, only tape horizontal surfaces, like baseboards and chair rail, where paint splatter can land and be noticeable. Vertical surfaces, like door and window trim, aren’t as vulnerable to splatter, so don’t bother taping them. Just be sure to cut in carefully with your paintbrush so you don’t slop paint onto the trim. If you’re right handed, paint the wall from left to right. If your left handed, paint from right to left and reverse all the following directions. Right handed : Load the roller sleeve with paint and roll from the baseboard to the ceiling to get the paint on the wall. Then roll straight back down, without reloading the roller, to ensure the wall is covered. Load the roller and move over about 3 inchs to the right and roll the full height of the wall again to feather out the leading edge. When you get to the top, move about 6 in. to the left, without reloading, and roll back down to smooth out any runs or lap marks. Then reload the roller, place it on the feathered edge and start the process over. As you paint, roll horizontally where you cut in along the baseboard and ceiling. Only roll about 3 ft. at a time so the paint will stay wet as you roll the walls.